We’re going to replace the small wheels with larger ones to make the house easier to move. We’ve been playing around with chicken house designs for a while now. The first version was low-slung with two wheels at one end and two handles at the other. It can be moved easily by one person as long as the terrain is reasonably un-bumpy. The whole roof is hinged and inside there’s a single perch and four nesting boxes. The whole roof lifts open for ease of egg-collecting and cleaning. We found it was the perfect size for bantams, though we have also used it when we needed to segregate a few Light Brahma hens with Bill during breeding season. This solid house has a locking door for security at night. That door opened into a wire chute, which led to one of our hoop-house design wire runs. 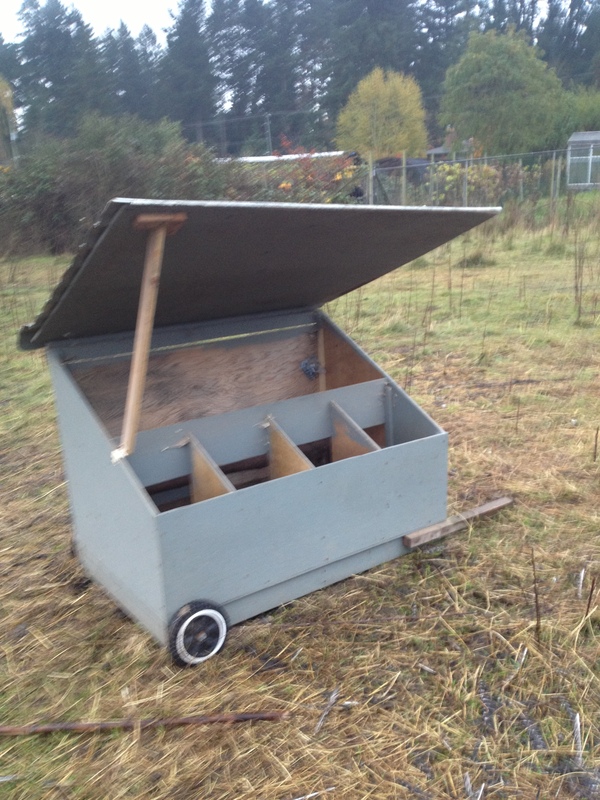 The whole thing (house plus attached portable run) is easily moved and, for a few bantams, provides lots of protection from birds of prey (we have trouble with eagles, ravens, and hawks). They get fresh grass and safe outdoor living while being protected. But, it was really too small for full-sized chickens on a long-term basis. So, we built a bigger chicken house and a larger attached run-out, which will be the subject of a future post. 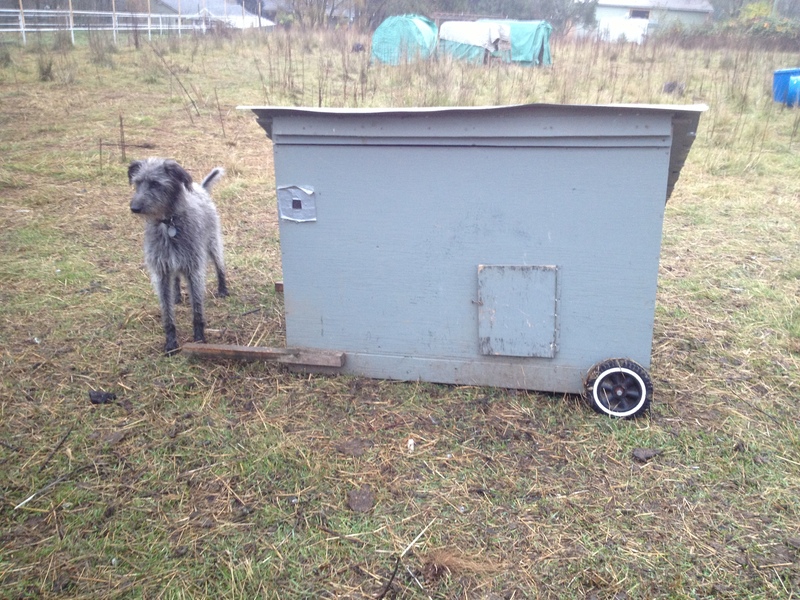 Pippi standing beside the chicken house for scale – not that this helps if you don’t know how tall she is! If you haven’t met her in person, she is just a bit taller than my knees. If you haven’t met me, that’s not particularly tall. So maybe putting the dog in there wasn’t very useful at all! 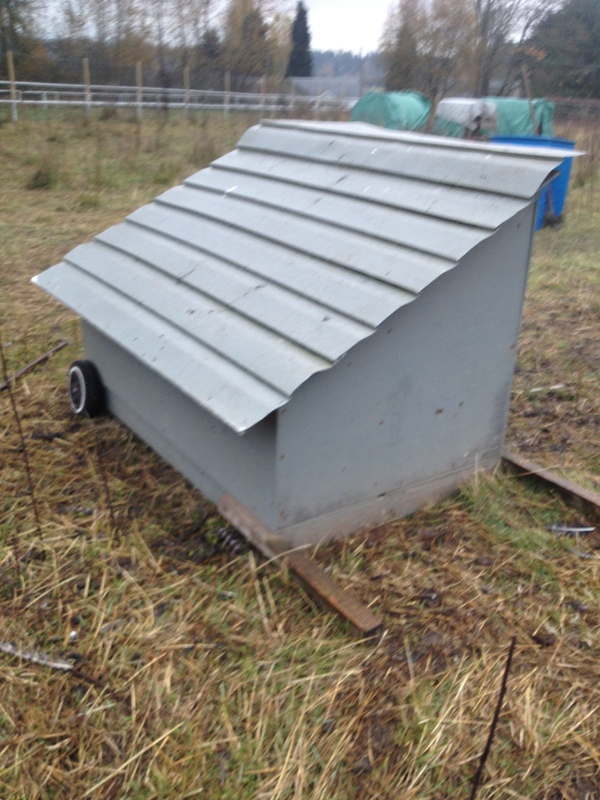 This entry was posted in Blog, Chickens, Uncategorized and tagged chicken coop, chickens, chooks, coop design, Dark Creek Farm, farm, hens, homestead. Bookmark the permalink. Interesting. I like the way this is designed, but I too need something bigger for bigger and more birds. A bigger version of this would be too heavy to lift, I’m guessing. Wider base? Wire for top half of sides? Have you seen Eliot Coleman’s chickshaws? Garden cart based, aluminum frames…I don’t have the know how to do the frames, but the garden cart base gives me ideas. Stay tuned… I’ll be posting more photos soon of our later efforts. I haven’t seen the chickshaws – will check them out.